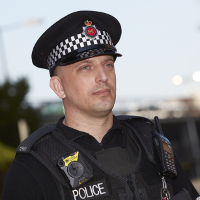 SSAIB, the UK and Ireland’s leading security, fire and telecare certification body, announces that two police forces have pioneered the introduction of body-worn video (BWV) technology in accordance with the Surveillance Camera Code of Practice. Following certification to the Code, completed by SSAIB auditors, the Greater Manchester Police and Metropolitan Police Service are now using devices for a variety of innovative and beneficial applications. BWV technology is now being used in a variety of ways to capture police operational activity first hand, using helmet or vest-mounted cameras. These affordable cameras provide high-quality images and audio, which can be used for evidential purposes. Andy Marsh, who was the National Policing Lead for body-worn video (and is now Chief Constable of Avon and Somerset police), reported in 2014 that this technology’s advantages include enhanced contemporaneous evidence capture and swifter justice through early guilty pleas and admissions. “It can also inform more appropriate sentencing and help to reduce bureaucracy throughout the criminal justice processes by focusing on the needs of victims. Finally, it supports transparency, trust and confidence in the police,” he added. The Greater Manchester Police experience began with a trial of 80 BWV cameras among response teams in the north and south of Manchester between 2012-13. An initial 12-week pilot led to a roll-out of BWV cameras from March 2016 to all operational front-line police officers and specialist units. Approximately 3200 units will eventually be deployed, with further plans for the scheme to additionally include police community support officers in 2017. Operational use of the body-worn devices takes account of guidance published by Greater Manchester’s Police & Crime Commissioner, following a report by the Independent Police Ethics Committee. It concluded that the technology could help improve the criminal justice process for victims of domestic abuse, by gathering crucial evidence to make it quicker and easier to obtain a conviction, and relieving the pressure on victims who don’t feel able to attend court. Meanwhile, following an initial year-long pilot project involving the distribution of around 500 cameras among emergency response teams spread across 10 London Boroughs, the Metropolitan Police Service is now rolling out BWV technology across the capital. This three-phase programme entails the deployment of approximately 22,000 camera units, which is due for completion by mid-2017. The force’s initial pilot scheme was studied by the College of Policing and the Mayor’s Office for Policing and Crime. Their reported findings included potential benefits from BWV including a reduced number of allegations against officers, particularly of oppressive behaviour. Complaints related to interactions with the public also reduced. SSAIB provides a third party certification service to the Surveillance Camera Commissioner that enables local authorities and those operating public space camera surveillance systems to demonstrate their conformance with the Code of Practice, which the Commissioner calls a “universally accepted example of good practice”. Full certification (which lasts for five years) is achieved through a two-step process, with an initial desktop review of an organisation’s completed self-assessment being followed within 12 months by an on-site audit. The Commissioner is required to ensure that ‘relevant authorities’, including local authorities and the police, comply with the code.